If you have a backyard that's rocky, sloped, or hilly, you might find it difficult to use the space for family gatherings or fun things like sports. Many homeowners have this problem and convert their yard into more usable space by creating terraces with retaining walls. Retaining walls change a gradual slope to two or more flat levels. The walls can be made with large rocks, concrete blocks, or other hardscaping materials. With retaining walls in place, you can more easily create level patios, fields for playing sports, areas for making garden plots, or space to make Alpharetta water gardens. Here are more details about all the things you can do with a backyard retaining wall. One of the best things to do on a summer day in your backyard is to throw some hamburgers on the grill and relax with family or friends. With a sloped or uneven backyard, grilling or eating can be almost impossible, unless you're willing to put a picnic blanket on the side of a hill. When you level your yard and put up a retaining wall to make levels, you can create distinct spaces that can hold tables, chairs, and a grill on top of an easy-to-clean stone or concrete patio. With the help of patio pavers in Alpharetta, you'll be drinking and grilling in the peace of your own yard in no time. Who doesn't remember the blissful days of childhood when running around in the grass and playing ball with friends were the only things you had to worry about? Uneven lawns also make it difficult to play ball or run around. Retaining walls create level fields where you or your kids can hold games of football, soccer, or badminton. These types of backyard activities will mean that your property is actually being used and isn't just a place you need to weed and take care of. Whether you like flowers or vegetable gardens, growing plants is easier when you have a terraced area with flat sections for each of your beds and the essential irrigation system between them. 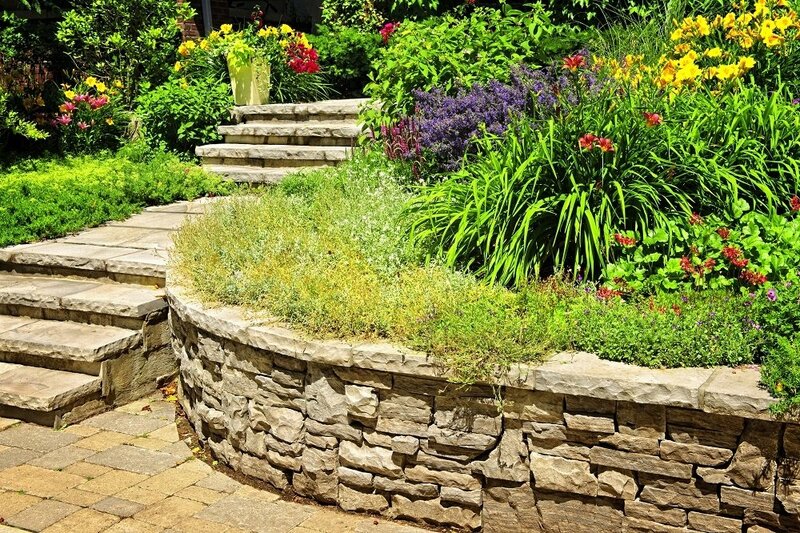 Keeping your plants watered and healthy is a lot easier with designated spaces created with retaining walls and garden paths made by professionals in hardscaping in Alpharetta. If you have a vision for how you want your backyard to be transformed into a place where it's easy to grow a garden or a large variety of flowers, we can provide you with actionable ideas.